Start being social on social media -- spend time daily building one-on-one relationships. Use the functionality of each platform to maximize your audience size. Social media is not your soapbox. If you treat your social media accounts like you’re the only person who matters, it will be like starring on a mid-day soap opera — you’ll lose viewers. The answer is the same every time: Create more relationships with people, and build on your existing relationships. Or breakout the checkbook. I prefer the first option. Now, you can read a ton of blogs or watch Gary Vaynerchuk videos that preach “giving value” upfront, but if you never do it, it doesn’t matter. You’ll never get attention if you don’t embrace action. So in this article, I wanted to show you actionable ways to build relationships with people on social media. Specifically, on Facebook, Twitter and LinkedIn. 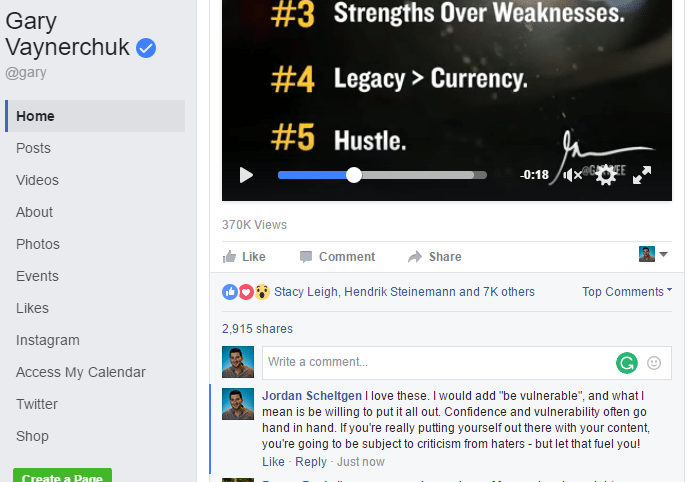 If you don’t have an audience on Facebook, you need to growth hack using someone else’s. Let me explain. It starts with identifying five to 10 companies/people on Facebook who share a customer base with you but aren’t competitors. So if you’re a Realtor, looking at local lenders, title companies and news outlets are a great place to start. Once you’ve got your list, you’re going to set up notifications for all of these pages so you will see every time they post. If you think is too much work, then stop reading, and go back to spamming listings to everyone – growing an organic following is tough work. So let’s look at what I do. 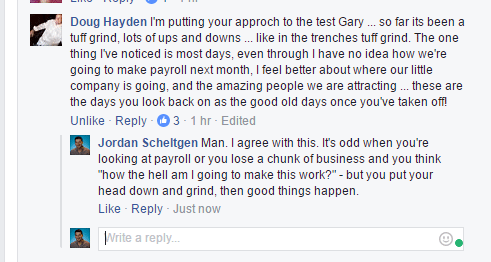 Below is a post Gary Vaynerchuk put out — I am trying to build a similar audience, so I regularly participate in his comments section. My goal is to add value to a discussion he’s started and interact/engage with individuals who are adding value to the discussion. By doing this, I’m not selling anything. My intent is simply to facilitate discussion. 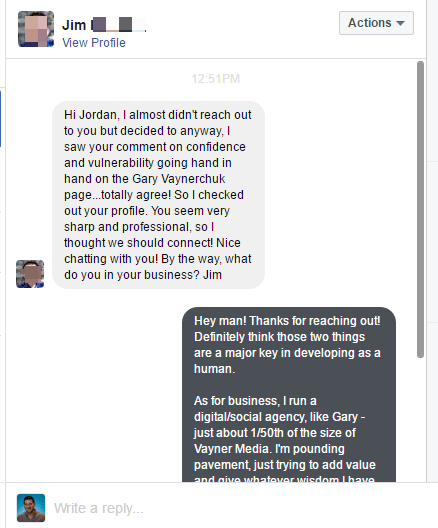 The more discussions I have, the more my page grows and the more I build my audience. Twitter is my favorite place to build an audience. The fast-paced nature of the platform allows for you to engage in back and forth on certain topics, all in a crisp 14o characters. The strategy is simple: Use Twitter search to find people in your area. 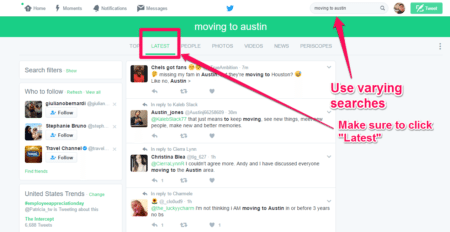 For example, if you’re a realtor in Austin, Texas, then head over to Twitter and type something along the lines of “moving to Austin” into the search bar. After a bit of scrolling I came across Beckie’s tweet on how she plans to buy a house in South Austin in the future. I would consider this a lead, but it’s a delicate one. The key to this strategy is to be friendly, not salesly. So, if I was a Realtor I would tweet something like this (below) to Beckie. LinkedIn is a great place to connect with other professionals. Your knowledge of the industry can be shown through several ways, but what I want to focus on is LinkedIn Pulse articles. Pulse is the blogging platform native to LinkedIn. Every time someone posts an article on LinkedIn, his or her network is notified that they’ve put out a post. This is great if your content is up to par. This is bad if you’re going to post a shameless self-promoting blog — people will tune you out. Take your best blog post, and republish it on LinkedIn. If your content is strong, you will gain followers and see a ton of engagement on your content. I did on “How I Became a Morning Person“ and here are the results it has produced. These are three actionable pieces of advice that don’t cost anything but time.